Our new "Gower" van builds on all the great feedback we had on our original design over the previous four years. As another first for GoBongo we had the original rear seats on this van flat profiled by South West Auto Trimming, so you can sleep directly on the seats with no extra mattress required. Mains power is easily hooked up by a long lead from the campsite supply, and all equipment can be operated from outside under the cover of the rear lifting door, which provides excellent shelter in bad weather. With the kitchen unit in place the middle and front seats of the van can be folded flat to create a full-width double bed for comfortable overnight sleeping. 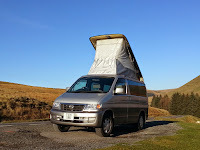 As with all our Bongos there is a further full size double berth available on a platform in the lifting roof, giving the potential to sleep upto 4 in the van if required. The internal layout can be seen in the photos below. An optional driveaway awning is highly recommended if you are staying more than one night at each campsite. Our high-tech fast erect Khyam awning will greatly increase your living space and can be left on site when you go out for the day. An inner sleeping tent is also included which clips up easily inside to create a further double-berth if required. An additional benefit of the awning is that two people can easily remove the kitchen unit from the rear of the van to be stored and used in the awning, which has its own electric hookup unit. 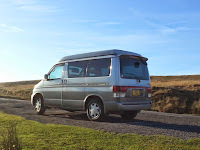 This allows the rear seats in the van to be moved back, creating maximum seating space in the van by day, and a full length double bed in the rear of the van by night. Another option is the Camel luggage trailer, which is the perfect complement for a relaxing family holiday. This high sided trailer gives over 800 litres of fully enclosed storage and is simple to tow with no previous experience required. It will hold all our equipment, together with some or all of your luggage, leaving maximum space in the main cabin for your passengers on the trip to and from site. Security locks are provided so you can safely leave your trailer ( and awning ) on site when you go out for the day. See our “extras” page for more details.